Posted in: Dee Why. Tags: ESE-1m-11s. From the forecast I’d expected grey skies and showers, but instead Mother’s Day kicks off in sunny form with the last little remnants of our swell still coming in. Size is now in the knee to waist range, but that’d probably suit many requirements this morning. Plenty of folk bobbing around at the Dee Why end of the Longy-Dee Why stretch, and given the swell direction, I should imagine there’d be similar arrangements in place across many of Sydney’s beaches thanks to the metre or so of 11 sec ESE swell. From the look of the buoy data, the decline in energy has occurred uniformly up and down the NSW coast. There might be a few places still getting the odd shoulder high bomb, but they’d be few and far between. Wind should stay out of the westerly quarters today, although some shower activity is expected later. Next tide is a low at 1135. Speaking of the wind, this morning’s forecast from the Bureau tells us that tomorrow we’re in for southerlies, turning SE later and Tuesday looks set to be E-SE. Not the best. The swell models are a bit all over the place, but there is a consensus that Sydney should see a low, but long period pulse Tue-Wed. If I had to pick a high point for the week, I’d say Wednesday morning before the wind goes onshore. To all our mums, have a great Mother’s Day! All aboard, it’s a party wave. A southerly change associated with a cold front crossing the southern Tasman Sea is moving along New South Wales south coast and it will reach Sydney Waters by Sunday afternoon and the far north coast early Monday. Behind the change a high pressure system will move east Tasmania during Monday morning extending a ridge to the north coast. This high is expected to be slow-moving over the next few days. Northwest to southwesterly 10 to 15 knots tending southwesterly in the middle of the day then tending southerly 15 to 20 knots in the early afternoon. Southerly 15 to 20 knots tending southeasterly in the morning. East to southeasterly 10 to 15 knots. Posted in: Dee Why. Tags: 124d-0.9m-10.8s-23C, ESE-1m-11s. 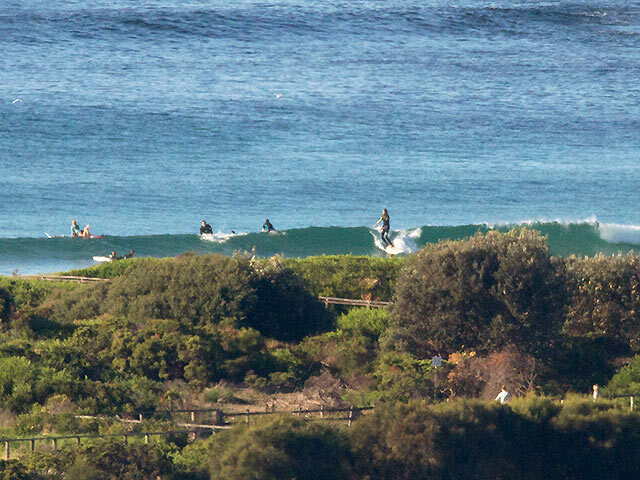 A cool NW wind was standing up the little waist high close outs at Dee Why beach around 0700. Swell was out of the ESE at about a metre with an average period of close to 11 seconds. There’s enough energy showing to make me think that places with banks should be delivering the odd diversion. The wind is set to drop back later and shift SW later, so it’s possible that after the turn of the tide, there could be a few little fun ones around. It looks as though wind is going to be the dominant factor this weekend, with tomorrow’s outlook shaping up to be pretty crazy. The low making all the wind will also be slinging some hefty swell at the coast by tomorrow afternoon. According to the Bureau it’ll be S-SW 30-40 kts from about lunchtime and the swell will be on the build into the 2+ metre range with seas of up to 4 metres on top of it. I’ll be very interested to see what the Goat makes of the forecasts, because it looks to me like plenty of swell for the next week with a fair amount of cloudy weather. Tide will be low at 1150 and then back to high at 1805. Have yourself a top old Friday each and every one! A low pressure system is expected to develop east of Bass Strait today, then deepen and move slowly to the north/northeast this evening, bringing gale force winds to the South Coast. The low is forecast to continue to move to the north/northeast during Saturday, with gales spreading north to the central part of the coast, then to the southern Mid North Coast later in the day. The low is expected to move slowly east then southeast away from the coast during Sunday with winds gradually easing. Northwesterly 15 to 20 knots turning west to southwesterly 10 to 15 knots in the early afternoon. The chance of thunderstorms from the late morning. West to southwesterly 20 to 30 knots tending south to southwesterly 30 to 40 knots around the middle of the day. 1.5 to 2.5 metres, increasing to 2.5 to 4 metres during the afternoon. Southeasterly below 1 metre, increasing to 1 to 1.5 metres during the morning, then increasing to 1.5 to 2.5 metres during the afternoon. Southeasterly 2 to 3 metres. Another sunny and mild day coming up. Tide seems a bit too high for the small (1 metre) ESE swell. The 11 second period is staving off absolute flatness. However, it could be a close thing as the tide drops, because the swell is fading too. This morning’s forecast models are projecting flatness from tomorrow through to Thursday morning when we might see some junky south swell activity start to build. At this stage it doesn’t look like building much though – maybe a couple of metres briefly at the peak (but with a fair amount of southerly). Longer term outlook currently seems to be for waist to chest high toward the end of the week with a possible brief excursion on Sunday into something bigger – but it’s supposed to be south swell and south wind again. It seems as though we might be heading into a more spring like pattern of brief pulses of windy south swell punctuating increasingly longer marginal to flat spells. Keep on smilin’ and have yourself a top Monday! ps: still doing the groundwork for the crowdfunding campaign… thanks so much for all the encouraging responses! A ridge of high pressure lies over northern New South Wales. A cold front is forecast to traverse the region during Tuesday, with vigorous winds over southern and central parts of the coast developing ahead of and with the passage of the front. Winds are expected to ease on Wednesday, as the front moves away from the coast. Westerly 15 to 20 knots turning northwesterly in the middle of the day. 1 to 1.5 metres, decreasing below 1 metre around midday, then increasing to 1 to 1.5 metres by early evening. Easterly 1 to 1.5 metres, decreasing to around 1 metre during the afternoon. Northwesterly 15 to 25 knots increasing to 20 to 30 knots in the morning then tending northwest to southwesterly 20 to 25 knots in the afternoon. Easterly up to 1 metre. Westerly 15 to 20 knots tending southwesterly during the morning. Small ESE swell of about a metre at 11 seconds is delivering the odd chest high set for the patient many bobbing about along Dee Why beach. Wind was light early but is expected to pick up from the north as the day goes along so conditions at many spots will turn sideshore. Next tide’s a high at 1240, so the plan is definitely to hit it early before the tide and wind combo messes things up. Outlook generally is for energy levels to bumble along at around these levels through to mid-week – and likely beyond. Forecast issued at 4:10 am EST on Sunday 28 July 2013. A high pressure system over the Tasman Sea extends a ridge over eastern New South Wales with generally light winds for coastal waters. The next cold front is expected to reach the state’s western border during Sunday, continuing across to the coast on Monday and Tuesday with northerly winds developing ahead of the front. 1 to 1.5 metres, increasing to 1.5 to 2 metres later in the evening. Northerly 20 to 25 knots, decreasing to 10 to 15 knots in the morning. 1 to 2 metres, decreasing below 1 metre around midday, then increasing to 1 to 1.5 metres by early evening. Northwesterly 10 to 15 knots shifting south to southwesterly 15 to 25 knots during the day. 1 to 1.5 metres, increasing to 1 to 2 metres during the afternoon or evening. Easterly around 1 metre, increasing to 1 to 1.5 metres during the evening. Posted in: Surf Reports. Tags: ESE-1m-11s. 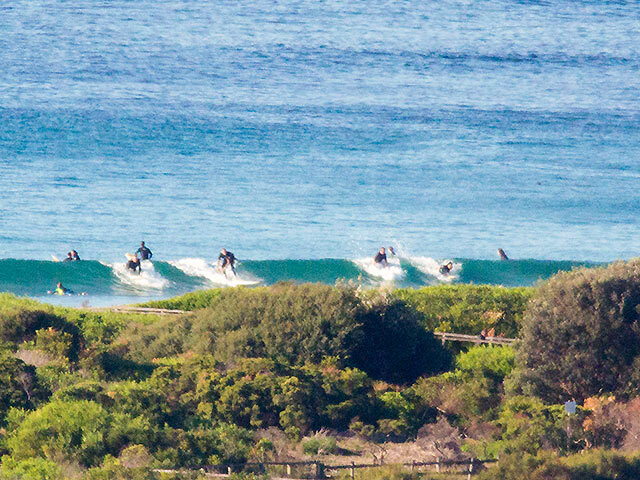 The faint little ESE swell of the last few days has kind of shuffled the deck (touch bigger, but touch shorter period) with the result that as of 0730 there were sets into the chest range (on take off) at Dee Why beach. Surface looked pretty smooth too. Tide’s low at @0825 and high at @1505. A strong, slow-moving high pressure system over the Tasman Sea extends a ridge into northeastern New South Wales, while a weakening trough lies off the southern coast. Northerly winds are expected to increase significantly during Thursday ahead of a vigorous cold front approaching from the west, and are likely to remain fresh to strong as the front crosses the coast during the weekend. North to northwesterly about 10 knots tending north to northeasterly 10 to 15 knots in the afternoon. Northeasterly 1 to 1.5 metres, tending easterly around 1 metre around midday. Northerly 15 to 20 knots tending northeasterly 20 to 30 knots in the evening. 1 to 1.5 metres, increasing to 2 to 2.5 metres by evening. Northerly 20 to 30 knots turning northwesterly during the afternoon. Interesting. Swell continues its decline and this morning was around the metre mark. On the plus side, it seems to have a touch more east and the period is still a respectable 11 seconds or so. At Dee Why before 0800 the tide was coming into the high at 1050 and while it was making the waves look a bit fat, there were still a few sets in the chest plus range at the beach. Wind was offshore and skies were sunny (unless you were on the Hawkesbury). We’re headed to a high of around 19 and the wind is set to stay out of the NW. According to this morning’s modelling, the swell is going to fade today. Given that big high tide late morning, it could be pretty fat and slow most places, but that said, there should be something for your fave low energy level surf instrument. West to northwesterly about 10 knots. South to southwesterly about 10 knots tending south to southeasterly 10 to 15 knots in the late afternoon then decreasing to about 10 knots in the evening.